Unfortunately time constraints (i.e my day job) keep getting in the way of me updating this site so all Ive been able to do so far for the Luton Town Nickname page is a very basic bit of background. 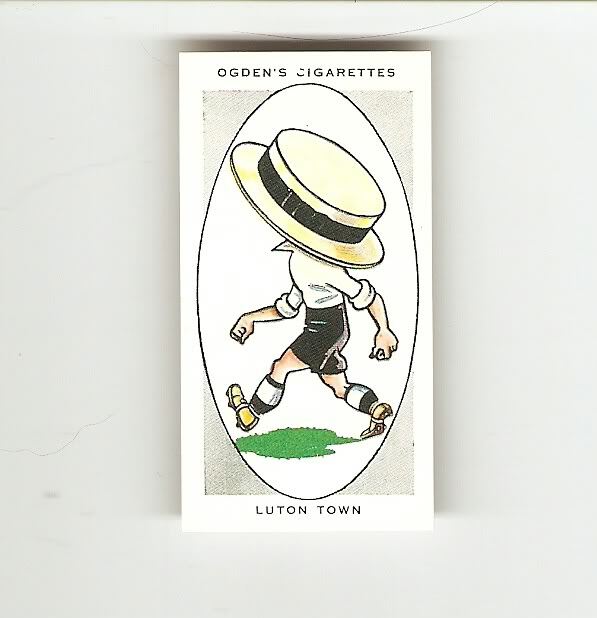 Ive shown below a football cigarette card from the Ogdens AFC Nicknames series that shows a footballer with a hat on, which of course depicts Luton Towns "Hatters" nickname !! "Luton is famous for its straw-plaiting industry and when the boater was commonly worn the club was known as the “Straw-hatters”. The name is still used, and when the team did so well in the Cup competition 1932-33, supporters accompanied them to Goodison Park, Everton, wearing straw hats. Joining the old Southern Leagueon its formation, Luton remained in membership until the Third Division of the Football League was created. The club was one of the first in the south to adopt professionalism. Formed in 1885 they gave three of their players the proceeds of a match in their second season". So there you are, a very brief overview of the Luton Town nickname, theres a bit to expand on yet though so I will come back to this page shortly.